With a crime syndicate hiding right under his nose, what exactly can Superman do about it? Luckily, Clark Kent can help with the investigation in only a way that a reporter can, interviewing people. Minor spoilers for Action Comics no. 1005 follow. One of the things that I’ve loved the most about Action Comics since Brian Michael Bendis took over both it and Superman is the vast differentiation between the two books. They tell two vastly different stories and have very different focuses. Action Comics has been much more character driven around Clark Kent and mystery driven rather than the bombastic action that encompasses Superman and that continues here as well. This is a slow-burn mystery story so far and its all the better for it. What Bendis has done well since his tenure on Superman began is the focus on Clark Kent. Many creators focus much more on Superman than they do his alter ego, which often creates a very one-sided story in the way that action and character are handled. In Bendis case though, by writing by books he can do both single-handedly and he does it well. And his handling of Clark in this issue continues to be great. As someone who has never really been the biggest Superman fan, Bendis’ writing of the character brings something more to the table. There’s a humanity that other characters always say that Superman has, but writers rarely tend to show. Bendis shows all of that by focusing on the Clark side. You see him joking around with other people, being a journalist, and even not going after someone he needs to talk because they’re drunk and curled up into the fetal position. It’s the humanity and kindness that everyone says that Superman has shown through Clark, which makes more a great read. Adding onto the dichotomy of that though is Bendis bringing The Question back into the fold. He’s on the same case as Superman, but what exactly will his role be as the story continues. I don’t know and I don’t really care. 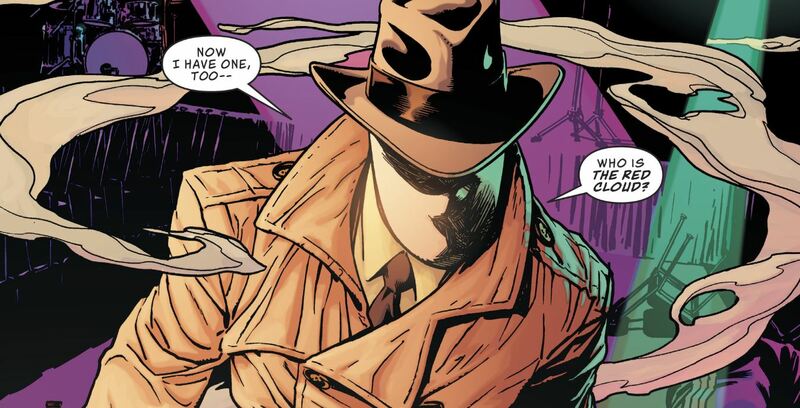 I’m a big fan of The Question just because of the 52 series and Renee Montoya’s tenure as the character, so it’s nice to see him back in the fold and used so well. Speaking of The Question though, it’s during the first couple pages of the issue where the art by Ryan Sook shines the brightest. Sook nails the brutality and ferocity that The Question has when fighting, but also the mystery that is the character based around the framing and lighting of the scene. Sook also makes him look very Rorschach-like, which is ironic because Rorschach was originally supposed to The Question in Watchmen, and I guess now the circle is closed. Sook does a great job with Clark in this issue as well. There’s a very Gary Frank look to the way that Sook draws Clark, albeit smoother than Frank does. As mentioned up above that this issue humanizes Clark, it definitely helps that the art is as expressive as it is. And Sook’s Superman feels powerful as well, whether he be standing or flying, there’s a power that he exudes. Action Comics delivers another solid issue that brings in several more wrinkles into the mystery that will seemingly be the crux of decent portion of Brian Michael Bendis’ run.